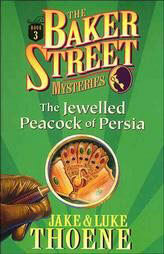 Sherlock Holmes & The Jeweled Peacock of Persia: A priceless and mysterious jewelled peacock is spirited away from a Persian tomb by an archaeologist who gives little thought to the ancient curse attached to the treasure. But terrible events happen that convince many that the curse is real. Can the boys find the clue that Sherlock Holmes himself missed?